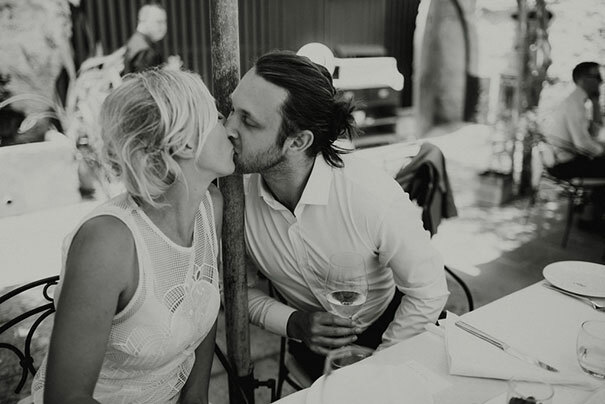 Held at Rampila, a fine dining restaurant and wine bar, the pair tells us that they didn’t need a theme for their day because Malta said it all on its own. “The location itself dictated the vibe, sunny, summertime, Mediterranean, relaxed and fun. We had a daytime wedding as we had family with kids and we wanted to make the most of the beautiful sunshine,” says Petra, who absolutely rocked her Alice McCall get-up. CREDITS Photos I Got You Babe Weddings // Bridal gown Alice McCall // Shoes Miu Miu // Rings Suzi Zutic and Natalia Milosz-Piekarska // Jacket Etro // Shirt, cufflinks and shoes Paul Smith // Pants Aquila // Ceremony Lower Barrakka Gardens, Malta // Reception Rampila, Malta // Celebrant Gail De Bono.